Lowell’s first Hockey East title and first appearance in the Frozen Four has special meaning for one ex-Terrier. Bill Riley, a linemate of Jack Parker for three seasons (1965-68), coached Lowell (initially Lowell Tech before it merged with Univ. of Lowell) for 22 seasons, leading the team to three Division II national titles, before the Riverhawks moved up to Division 1 and then joined Hockey East. 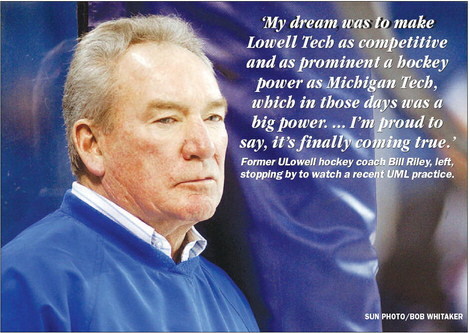 Riley, who played in the the 1966 and 1967 Final Fours as a Terrier forward, talked with the Lowell Sun about the vision he had way back when for the program, which is just two wins away from its first D1 title. FoxSports Southwest talked with Dallas Stars Coach Glen Gulutzan and with Alex Chiasson about the former Terrier scoring leader’s early success since his call-up from the AHL. With the Stars looking to get younger, faster, and bigger, Chiasson has fit in nicely, skating on the team’s top line with Ray Whitney and Jamie Benn. He picked up his first NHL assist—to go with three goals—in the Stars’ 5-1 win against Los Angeles. Matt Nieto scored his second professional goal at Worcester blanked Bridgeport, 3-0. In five games, the former Terrier wing has four points. Former BU co-captain John McCarthy added an assist for the Sharks. Co-captain Marie-Philip Poulin and former Terriers Jenn Wakefield and Catherine Ward earned Silver medals at the IIHF World Championships as Team Canada fell to Team USA in the championship game, 3-2. Poulin, who lead all skaters with 12 points and tied for most goals with six, was named the tournament’s Most Valuable Player and top forward.